A serve through the serving hole is used to put the ball into play at the start of the match, after a point is scored, or after a ball leaves the table. The server may attempt to influence the roll of the ball, but may not allow any part of either hand to be in the play area once the ball hits the playfield. The play area shall be defined as the area above the playing surface to the height of the side boards of the cabinet. Prior to serving the ball, the server may place either hand in the play area in order to position the ball. However, no part of either hand may be in the play area at the moment the ball is released into play. If the ball hits the playfield while any part of the servers hand is in the playing area, the serve shall be considered illegal. This includes any finger used to push the ball through the serving hole. The ball may not be struck by either team following a serve until it has touched the playfield, at which time the ball is considered to be in play and the time limits start. Spinning the ball shall be allowed in order to influence the serve, however, no point shall be scored by the serving team unless the ball is struck by one of the serving teams figures. The server must not serve the ball until he has the assurance that the opposing team is ready for play to begin. The server can signify that play is about to begin by tapping the ball on the side of the table. If the server has tapped the ball, and the opposing team is holding their handles, the opposing team shall be deemed to be ready for play (unless they have specially stated before the ball hits the playing surface that they are not ready yet). On the first violation of any part of this rule, the ball shall be re served by the original server. Subsequent violations, however, shall result in the ball being put into play by a server of the opposing team. If the ball is incorrectly served, but the server has not violated any part of these rules, the ball is considered in play. In particular, the player may not reach into the play area to re serve the ball. Following the first serve of a match, subsequent serves shall be made by the team last scored upon. First serves in subsequent games of a multi game match shall be made by the team which lost the preceding game. If the ball is served by the wrong team, and the violation is discovered before the ball is scored, play shall be stopped and the ball shall be re served by the proper team. Once the ball is scored, no protests shall be allowed, and play shall continue as if no infraction had been committed. If a team receives the serve because the opposing team is being penalized for a rules infraction, and if, after the ball is served, it goes dead or leaves the table and must be re served, it shall be re served by the team who originally served it prior to the infraction. Once a ball is put into play by the server, it shall remain in play until the ball is hit off the table, a dead ball is declared, time out is called, or a point is scored. If the ball should leave the playing area and strike the scoring marker, ash trays, top of the side rails, cabinet ends, or any object that is not a part of the table, the ball shall be declared off the table. The ball should be put back into play with a serve by the team which originally served that ball.A ball entering the serving cup and then returning to the playfield is still considered in play. A ball shall be declared a dead ball when it has completely stopped its motion and is not within reach of any player figure. If the ball is declared dead between the goal and two man rods, it shall be put back into play by placing the ball in the corner nearest the spot of the dead ball and releasing it into play from rest. The goalie must have the assurance that the opposing team is ready for play to continue before putting the ball back into play in this manner. Furthermore, the goalie must then move the ball from one player figure to another one and then stop the ball for a full second before the motion of a shot or pass may begin. The time limits begin one second after the ball touches the second man. If the ball is declared dead anywhere between the two man rods, it shall be put back into play with a serve by the team that originally served that ball. A ball that is spinning in place is not considered to be a dead ball. A ball that is intentionally made dead in order to advance the ball or reset the time limits shall be given to the opposing team for a re serve (example: the two man placing the ball just out of reach in order to re serve the ball). The penalty for illegally putting the ball back into play is the opponents choice of either continuing play from the current position or re serving the ball. This includes the cases where a player either loses the ball or scores on himself before the ball has been put back into play. 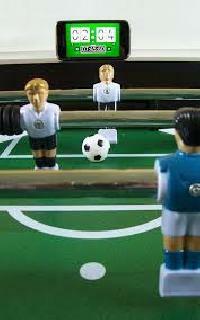 Each team is allowed two time outs per game during which the players may leave the table. Such time outs shall not exceed 30 seconds. If the ball is in play, time out may be called only by the team in possession of the ball, and then only if the ball is completely stopped. If the ball is not in play, either team may call time out. Rules Clarification August 1996 When calling a time out while the ball was in play, a team is allowed to take a second time out (providing they have one left) as long as they do not begin to put the ball back into play (by moving the ball). During an official time out, a team may not request a time out unless they would have otherwise been allowed to do so had the official time out not been called. Either team may take the full 30 seconds, even if the team that called the time out does not wish to take the full allotment. Either team may switch positions during a time out . A time out called between games shall apply to the following game to be played in counting time outs per game. A player who removes both hands from the handles and turns completely away from the table while the ball is in play shall be considered to have requested a time out. A player can take his hands from the handles to wipe them off before a shot, as long as it doesnt take more than two or three seconds. However the time limits continue to run while the player wipes his hands. The team on defense should not relax if the opponent takes his hand(s) off the rod. Either team member may call time out when either he or his partner has the ball. The time out starts the moment the time out is called. If the team with the ball attempts a shot or pass immediately after requesting a time out, the play shall not count, and the team shall be charged with a distraction rather than a time out. If the team in possession of the ball calls a time out while the ball is in play and moving, that team shall lose possession, and the ball shall be served by the opposing forward. If the team not in possession of the ball calls a time out when the ball is in play, that team shall be charged with a distraction. If a team is not ready to play at the end of the 30 second period, that team shall be charged with another time out. A team calling and/or charged with more than two time outs per game shall be charged with an automatic technical foul. The technical foul shall be shot before the 30 second period is granted. A team charged with a time out shall always be given the full 30 second period, even if they have previously taken two time outs, and either team may switch positions during this time. Once a player begins to put the ball back into play following a time out (by moving the ball), a time out may not be called again until the ball has left the current rod of possession. Penalty for violation of this rule is loss of possession, and the ball shall be served by the opposing forward. The team shall not be charged with a time out. During a time out a player may reach into the play area to spray the rods, wipe the playfield, etc. The ball may be picked up by hand, as long as it is returned to its original position before play is continued. During a time out the player may not move the ball from man to man without the permission of the official, as this can be considered practice. Penalty for violation of this rule is loss of possession and the ball shall be served by the opposing forward. If the official present feels that it would be impossible to be sure of accurately replacing the ball to the exact position it occupied at the time of a time out, they may deny a request to pick up the ball (example: a ball precariously perched on the edge of the goal). Following a time out, the ball shall be put back into play by the player who had possession when the time out was called. If the ball was in play when the time out was called, the player [B must have the assurance that the opposing team is ready before moving the ball. The player must then move the ball from one player figure to another one and then stop the ball for a full second before the motion of a shot or pass may begin. The time limit begins one second after the ball touches the second man. If the ball was not in play when the time out was called, the ball shall be put back into play with a serve by the team that originally served that ball. The penalty for illegally putting the ball back into play is the opponents choice of either continuing play from the current position or re serving the ball. This includes the case of a player losing the ball before touching two men. An official time out does not count towards the two time outs allowed per team per game. After an official time out, the ball is put back into play as though a regular time out were called. If an official is not present at the start of the match, and a dispute arises during play, either team may request an official. Such a request can be made at any point during the match that the ball is stopped or dead. The first request for an official is considered an official time out. The cost for the official will be split between the two teams. If the defensive team makes a request for an official while the ball is in play and stopped, and the offensive team simultaneously attempts a pass or shot, the request for a time out will be treated as a distraction by the defensive team. Likewise, a request for an official while the ball is in motion will also be considered a distraction. Any team subsequently requesting an official will automatically be charged with a time out. Such a request may only be made during a dead ball. The penalty for requesting another official while the ball is in play is a technical foul. The Head Official will decide whether the request for a new official will be granted. If the request is granted, the team requesting the official must pay the full cost of the new official. The two officials will then judge the match. An official may be replaced only at the discretion of the Head Official. If there are already two officials present, any request for a new official will be denied, and the team will be charged with a technical foul. A team may not switch positions during an official time out, unless they are otherwise entitled to do so. Table Maintenance Any necessary table maintenance, such as changing balls, tightening the men, etc., must be requested before the start of the match. The only time that a player may call a table maintenance time out during a match would be in the case of a sudden alteration to the table, such as a broken man, broken screw, crumbling bumper, bent rod, etc. If a player figure is broken while in contact with the ball, an official time out will be declared while the rod is fixed. 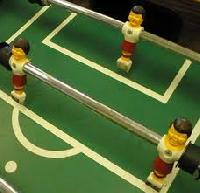 Play will resume on the rod where the player figure broke. If the table lighting fails, play shall immediately stop at that point (as though an official time out were called). Routine maintenance, such as spraying the rods, etc., should only be done during time outs and between games. Foreign objects on field of play if an object should fall on the playfield, play shall immediately stop at that point. 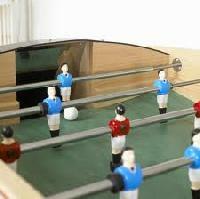 There should be nothing on the ends of the table that could fall onto the playfield. Medical time out a player or team may request a medical time out. This request must be approved by the Tournament Director, the Head Official, and a member of the officiating staff. They will determine the length of the medical time out, up to a maximum or 60 minutes. A player who is physically unable to continue playing after that time must forfeit the match. If the request for a medical time out is denied, the player will be charged with a time out. The player may also be penalized for delay of game , at the discretion of the official. Medical time outs will typically be granted only for accidental or unexpected injuries incurred during the course of play. A ball entering the goal shall count as a point, as long as it was legally scored. A ball which enters the goal but returns to the playing surface and/or leaves the table still counts as a goal. If a point is not counted on the scoring markers and both teams agree that it was previously scored and inadvertently not marked up, the point shall count. If both teams do not agree that a point was scored and not marked up, after another ball is scored, that point shall not be counted. If there is a controversy over whether or not the ball entered the goal, an official should be called. Any team intentionally marking up a point not scored shall not get credit for the point illegally marked up and shall be charged with a technical foul. Further violations of this rule will be grounds for forfeiture of game or match (to be determined by the Head Official).